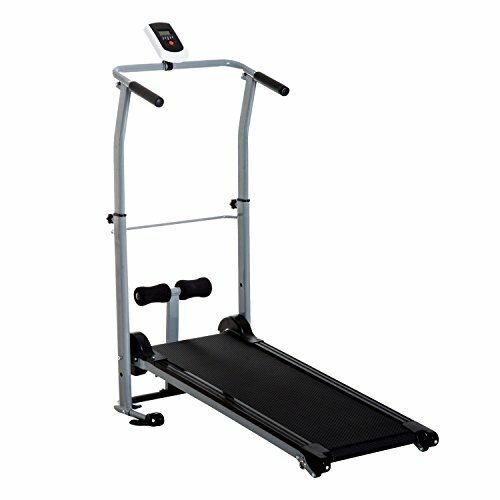 Don’t miss a workout with this compact Manual Walking Treadmill and Sit Up Machine. Set it up at home or at the office for a quick and easy workout then store it away in a vertical folded position when you’re done.Get some cardio and strengthen your legs with the manual walker that is powered by your strides, or work on your core muscles with the sit-up option that includes padded foam rollers. An LCD screen keeps track of your time, speed, distance, and calories burned.With 3 adjustable handle heights and 2 different incline positions you will be walking comfortably in no time. Lose all of those workout excuses and tone your whole body with this convenient multi-exercise machine. ✅CONVENIENT 2-IN-1 DESIGN: Includes both a manual walking treadmill and a sit up bench with padded foam rollers in a single design to help you work both your legs and your core. ✅YOU SET THE PACE: The manual treadmill does not use electricity or a motor which is an electricity saver, does not require an outlet, and allows you to set your own pace while working out. ✅LCD DISPLAY SCREEN: Easy to read LCD screen indicates time, speed, calorie, distance, keep track of your performance and monitor your progress. Also with scan function, which allows repeatedly display userÆs workout metrics. ✅ADJUSTABLE INTENSITY: Adjust your workout intensity by choosing from 2 different incline positions at 15 or 20✔, as well as 3 different handle heights. ✅FOLDS FOR EASY STORAGE: A vertical folding design with 2 rolling wheels allows for easy movement and storage when not in use. If you have any questions about this product by Soozier, contact us by completing and submitting the form below. If you are looking for a specif part number, please include it with your message.